The results are “preliminary” because we are still waiting for the final EPA test filter to dry out. We also have one more cordwood test to run early next week, but the cordwood tests will not affect our approval. The preliminary EPA results indicate heat output from 13,241 to 60,145 BTU/hr, with average emissions approximately 1.2 gm/hr, and average efficiency at a new record for EPA testing – over 82%. High efficiency really does boost heat output. 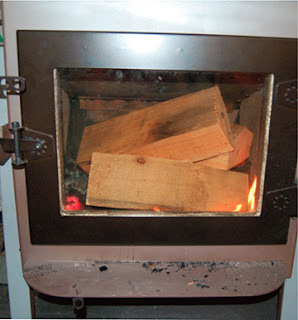 For example, our EPA low burn rate was 0.79 kg/hr (1.74 lb/hr). 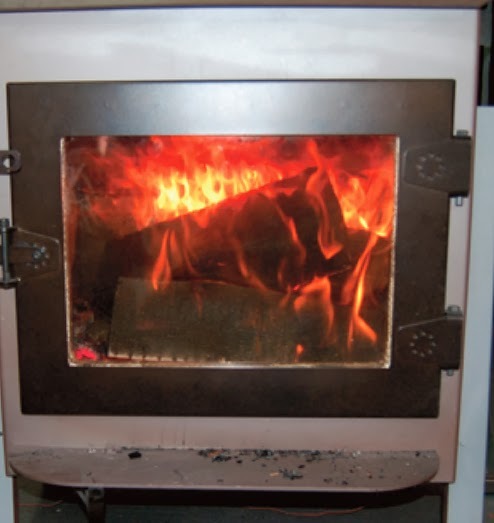 A non-catalytic stove would produce 9,546 BTUs/hr at a burn rate of 0.79 kg/hr with the same load, assuming the EPA default efficiency of 63%. Our Design contest stove produced 13,241 BTUs/hr, because it burned at 84% efficiency at 0.79 kg/hr. This is a 38% increase in usable heat output from the average non-catalytic stove to our Design Contest Hybrid! 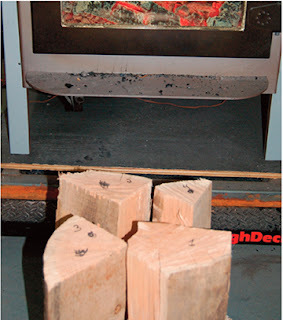 Cordwood tests on this stove show very similar efficiencies and emissions. We will publish more results as they become available, and of course we’ll have information available at the Washington DC event. Here’s a cordwood high burn test load. We really like the idea of a cordwood standard. It will provide much more accurate information about burn times and efficiencies with “real world” fuel. Here’s the load about 10 minutes into the test. More on this and other cordwood tests soon!